There are just a few more baking days until Christmas! We are doing some of ours this weekend and upcoming week, now that school is out for break. This delicious looking cookie by Amee of Cooking in Bliss caught my eye while picking today's feature. The combination of cranberries and white chocolate chips is what makes this cookie sound so good. 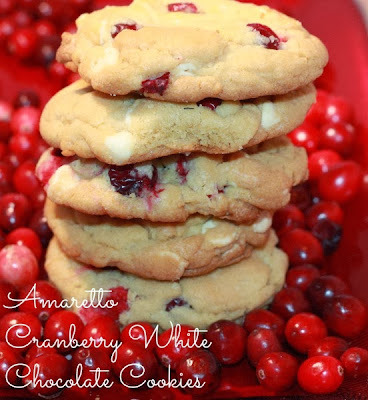 There is a teeny tiny amount of Amaretto in them, but it is a small enough amount that you need not worry about these cookies getting into the little hands. To see this recipe, be sure to check out Cooking in Bliss here. Thanks so much for linking up to Dare to Share Amee!